Bold entries in these tables indicate logs received by AD6E. This year's California QSO Party has again set new participation records. A record 538 logs were received this year, or about 10% more than last year. From California, we enjoyed a great opening to Europe, and the Japanese were out in force again. The biggest score by any station any where was the massive N6O effort put out by the Radio Oakley M/M folks. This team operated five transmitters and netted an astounding 4,933 QSO total. Thats 17% more than their previous record setting score last year. Congratulations to N6RO, N6BV, K3EST, K2KW, and K6AW. County hunting was made much more exciting with two major mobile competitors roaming the state. K6AQL wandered through 25 California counties, and WW6Z rumbled through an amazing 34 counties. Given the large size of California, working this event from 34 counties is a truly amazing feat. Another CA mobile, K6MO operated from a boat in the middle of San Pablo bay right at the point where Marin, Solono, Contra Costa, and Sonoma counties meet. 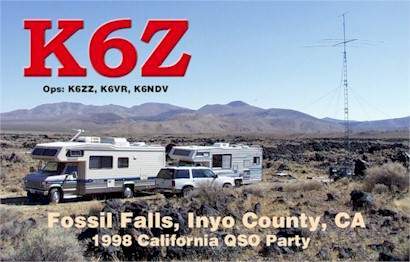 N6KZ was also a mobile in Kern county. All in all, mobile stations made 1,410 QSOs. With all this activity, no less than 30 stations outside CA managed a complete CA sweep. Compare that with only 14 sweeps last year! The very first sweep was made by WO4O when he worked W0EAX/6 in Yolo county at 23:35Z. Thats only 7 hours and 35 minutes into the contest. Congratulations! In CA, 49 stations found all 50 US states plus the eight Canadian call districts for sweeps. California County Expeditions are Field Day style operations from rare counties, or at least a nice location that is off the beaten path. This year saw 18 CCE operations in locations from San Diego to Trinity counties. NF1J/6 set up three different times putting Colusa, Lake, and Yolo counties on the air. There were three separate expeditions to Lake county alone. Although the top scores were not record breakers themselves, a total of 31 new records were set this year. 12 county records fell. 16 out of state records fell including the 5 year old South American record. So many new records were set this year that they are now tabularized below. I do want to give proper credit to Gary, VE7NTT, for his all time high score from anywhere outside CA last year. That very significant achievement was under reported in last years results. At 164,604 points I expect that high standard will last for some time. Certainly no one came close this year. This growing information age we live in continues to affect CQP. The number of "soft logs", or logs submitted that can be read by computer (email or floppy) almost doubled from last year to 213 (40%) out of a total of 538 logs. Virtually all of the top scoring stations used computers to do logging and submitted soft logs. There were two logs that were manually typed! Only 130 logs (24%) were written by hand with pencil or pen. 117 logs (22%) looked to be computer generated, but the owners didnt see fit to send in a machine readable copy; only a print out. Well have to work on those guys next year! So how active was the 98 CQP? There were 63,587 CW QSOs (34%) and 124,459 SSB QSOs (66%) reported in all the logs received. This generated a total of 24,380,814 points. However, that is not the whole story. By analyzing the soft logs received, there appeared to be about 5,684 valid, non-unique call signs in use during CQP. These ranged from 4N1DX to ZS6XL. That means only 10.5% of CQP participants sent in logs. We really need to work on those other guys to send in their logs next year! Log checking was tackled by AD6E, W6OAT, NF6S, W6ISO, N2ALE, N6DE, and K6III. Log checking rules were established by the team as follows: Any simple copying error such as wrong NR, wrong QTH, or wrong call was penalized by reducing the score by ½ of a QSO. Double copying errors (ex: wrong call and wrong NR) or worse were penalized by removing the QSO. The team used extensive search software to be as accurate as possible. Only QSOs that were either proven to be in error, or had a very highly probable error were reduced. Over all, log accuracy was very good. Claimed scores were reduced by an average of 1.89% and resulted in changing the outcome of final standing in only a few cases. The good news is that only five logs had greater than 10% score reductions due to errors. There were many "perfect" logs where no errors could be found. As one would expect, CW QSOs were reduced more than SSB QSOs: 1.86% compared to 0.82%. My thanks go to the log checkers who put in many hours of effort to get these results out. Their efforts have made these results more credible. Anyone who submitted a "soft" log can get a check file that details each and every deduction. Please send your request to cqp@contesting.com. I would like to give my personal thanks to Bruce, W6OSP for letting me use his station to set a new record in Napa. This is my first record, and I now understand the exhilaration of planning such an assault, meeting the challenges that Murphy throws in your path, and succeeding. This story could take a few beers to tell, and if you find me at the DX convention Ill be glad to tell the tale. I now have the greatest appreciation for Wendel, W6FSJ who held that record for 9 years. Im already thinking about the next challenge. Check logs were received from WB6YAW, IK2MLY, KQ6QW, and N2HHT.